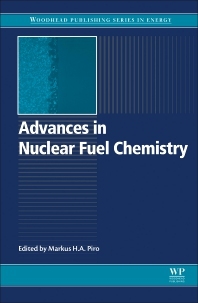 Advances in Nuclear Fuel Chemistry presents a high-level description of nuclear fuel chemistry based on the most recent research and advances. Dr. Markus H.A. Piro and his team of global, expert contributors cover all aspects of both the conventional uranium-based nuclear fuel cycle and non-conventional fuel cycles, including mining, refining, fabrication, and long-term storage, as well as emerging nuclear technologies, such as accident tolerant fuels and molten salt materials. Aimed at graduate students, researchers, academics and practicing engineers and regulators, this book will provide the reader with a single reference from which to learn the fundamentals of classical thermodynamics and radiochemistry. Dr. Piro earned a PhD in Nuclear Engineering from the Royal Military College of Canada with Profs. W.T. Thompson and B.J. Lewis, and held a Post-Doctoral Fellowship (PDF) at the Oak Ridge National Laboratory under the supervision of Dr. T.M. Besmann. Both PhD and PDF projects focused on computational thermochemistry of irradiated nuclear fuel. After the PDF, Dr. Piro became the Head of the Fuel Modelling and Fission Product Transport Section at the Canadian Nuclear Laboratories (CNL), where he led a multi-disciplinary group that supported both basic and applied research for government and industry. While his research at CNL broadly involved various aspects of fuel behaviour, the focus was on nuclear fuel chemistry of various fuel types, including conventional power reactor fuel, research reactor fuel, Generation IV concepts, and some exotic (proprietary) fuel designs for industry. In 2017, Dr. Piro was awarded a Canada Research Chair of Nuclear Fuels and Materials at the University of Ontario Institute of Technology. He is currently establishing a large group to focus on nuclear fuel and related materials research with the following research themes: i) nuclear fuel performance and safety; ii) spent fuel storage; and iii) emerging nuclear technologies. The overall intent of the research program is to have a balanced theoretical, experimental, and computational approach.